Are you proud of your daughter and want to let her know that you think she is a great Mom? Here is a gift that will become a lasting keepsake. Personalize it for daughter's birthday, Mother's Day or after the birth of her baby. 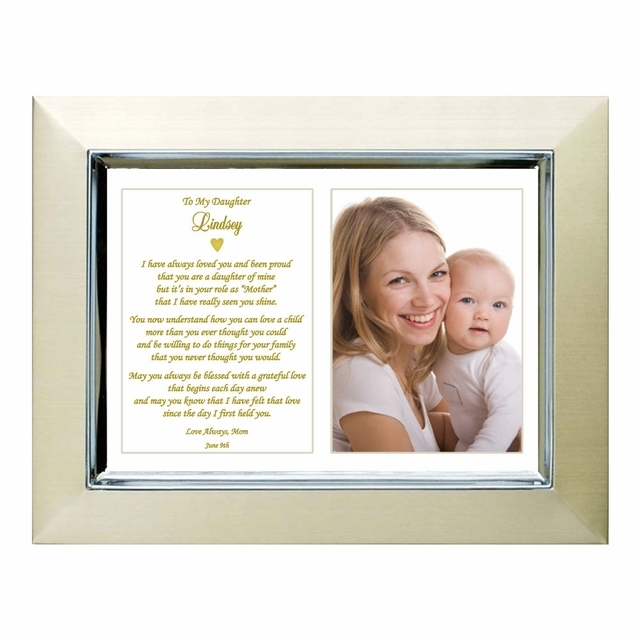 5x7 inch gold and silver frame (outside dimensions 7x9 inches) with an option for a photo area. Cut-out of the white mat measures 3x4 inches and the photo is inserted after delivery.. Wonderful personalized gift for your daughter on her birthday, Mother's Day or after the birth of her child. but it's in your role as "Mother"
that I have really seen you shine. that you never thought you would. since the day I first held you. that we have seen your real power. since the day we first held you. Love Love Love this! and I know my daughter will love it when I give it to her on Mother's Day. Couldn't wait to give it to my daughter so I gave it to her early!! She loved it!